Gov. Paul LePage in his State House office in November. The Legislature's Office of Program Evaluation and Government Accountability is already investigating another alleged threat by the governor to the board of a Maine charter school. 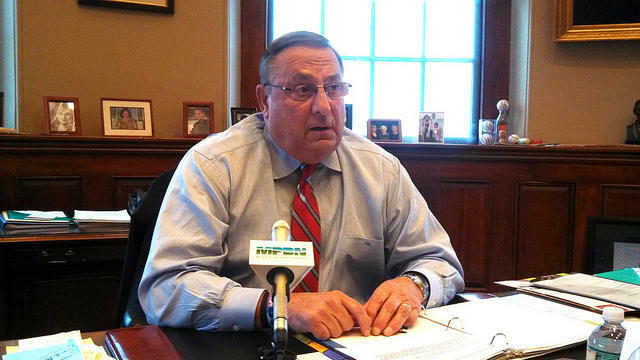 But the LePage administration is denying the latest allegations, made public last week by a political blogger. Democratic Maine Reps. Robert Saucier of Presque Isle and Roland Danny Martin of Sinclair say all they really want the Legislature's Office of Program Evaluation and Government Accountability to do is to separate fact from fiction for the sake of their constituents. "I'm doing this because it is the right thing to do and I think the Legislature and the public need to know whether our governor or anyone within his administration overstepped his legislative authority by threatening to withhold half a million dollars," says Martin, the House chair of the Legislature's State and Local Government Committee. Word of the alleged threat first surfaced in the political blog penned by Mike Tipping for the Bangor Daily News. Tipping works as the communications director for the Maine People's Alliance, a progressive advocacy group which often finds itself at odds with the LePage administration. According to Tipping, LePage wanted Jason Parent, the president of the World Acadian Congress in 2013, fired from his position for giving an Acadian Congress vanity license plate to then-U.S. Rep. Mike Michaud. Tipping said that LePage was insulted by the perceived snub and threatened to withhold a $500,000 state payment to the Congress if the board did not seek Parent's resignation, which was subsequently submitted. Tipping said his information was confirmed by Parent and by Acadian Congress board members. Martin also said the alleged threat was common knowledge among those associated with the Acadian Congress's activities two years ago. "Some of us in the valley here have known about this supposed allegation for some time, and I think Mr. Parent did not want to harm the World Acadian Congress and that's probably the reason why this hasn't been disclosed until very recently," Martin says. Maine's St. John Valley entered into a partnership with New Brunswick and Quebec to host the 2014 World Acadian Congress, a two-week festival that unites Francos from around the world. LePage's communications director, Peter Steele, has stated in no uncertain terms that the administration never threatened to withhold the Congress's funding. Instead, Steele maintains that Parent resigned because of internal problems within the board. "This bogus accusation is yet another example of the Maine Democrats being led around by the nose by the pro-welfare activists at Maine People’s Alliance," Steele says in an email. The Government Oversight Committee recently approved a probe into LePage's alleged threat to withhold state funding from the Good Will-Hinckley school unless it agreed to fire Democratic House Speaker Mark Eves as its new president, a position that LePage says Eves is not qualified to hold. Rep. Chuck Kruger, a Thomaston Democrat, says that investigation is due to wrap up in September and it may be difficult for the committee act on Martin and Saucier's request immediately. "The problem with adding another investigation, especially with a whole lot more unanswered questions, is that it would threaten to take us off track for our plan to deliver a report in September," Kruger says. The Government Oversight Committee is scheduled to meet on Aug. 20 and could take action on the request at that time.